I’ve been here in Australia for a couple months traveling around and enjoying myself in the great nature of this country. But then I realized I haven’t done something that’s worth giving a try, SURFING. 3 days at surf camp became one of most unforgettable and the best experiences in Australia for me! 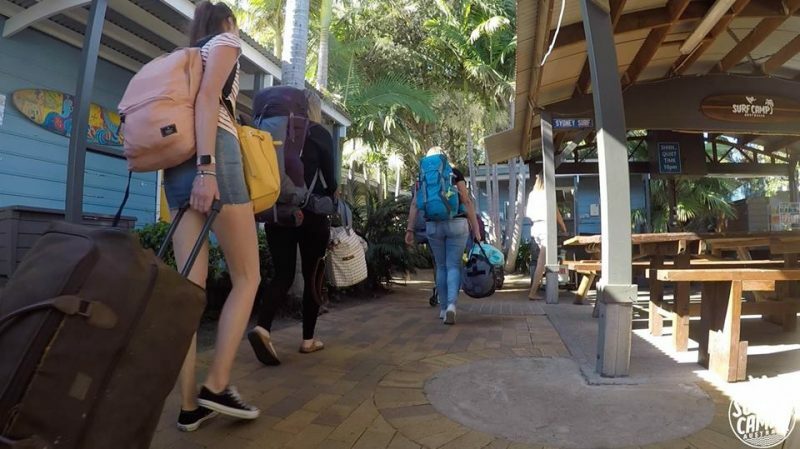 On Monday morning, I met up with other backpackers in front of Wake up! hostel and we headed to Gerroa on a comfy bus. It was only 2 hours and a bit till we get to the destination, where we were greeted with friendly staff and instructors. Then we had a quick orientation (which was pretty relaxed and fun) and got into our cabins. I got to share a room with 5 people from different countries. Although I was quite nervous at first thinking I may be the only one who is joining the camp by myself, many were actually solo travelers and were very friendly. After getting to know with other people, enjoying lunch and exploring the site, we were finally ready to go surf for the first time! Even though it was already in May, it was pretty warm during the day. After struggling a little bit to find a wetsuit that fits us (I ended up getting a kids size one because I am super short! ), we headed to 7 mile beach, which was only a few minutes walk from the cabins. We got divided into 2 big teams and had our very first lesson there. We learned the basics on sand such as how to get on boards, which waves are easy to catch and then did some practice as well. The instructors were super funny and the lesson was full of laughter even before we made our way into the ocean! 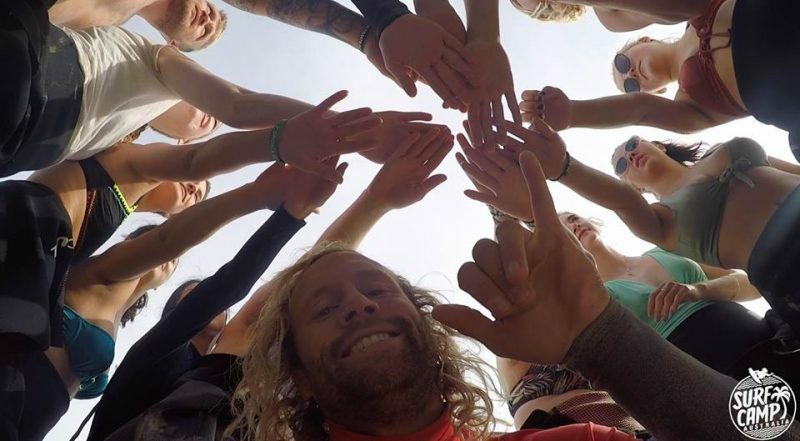 When we finally started practicing to surf, instructors gave us advise and helped us to get on the wave and most us could stand on the boards till the end of the lesson!I still cannot forget the feeling of surfing on the wave for the first time. It was so cool, lots of excitement and I have never felt that way. It was something I wouldn’t forget! After the lesson, we had delicious dinner and chilled for the rest of the day. I was impressed by the beautiful nature around the site as well. The sky was full of stars and I got to see some wildlife such as hares and a possum. On the second day, putting on our wet wetsuits was a little bit of struggle for us as it was pretty cold in the morning. Once we got on the beach, we learned how to check the conditions and see if the weather was good for surfing. We spent shorter time on listening to instructions and longer time on practicing surfing in the sea. By the time we finished our lesson, it got warm and we were happy to have another lesson! In the second lesson after lunch, we learned how to speed up and speed down. Many people were actually progressed so much by the time, being able to catch waves on their own. Instructors kept encouraging and entertaining us and we really enjoyed the day. We also got to watch a short video of our photos after the lesson. 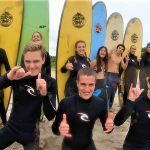 Every one of us loved the photos of ourselves and were amazed by their jobs on capturing the best moments of our surfing experience. My last day at surf camp started with a beautiful sunrise. I and some of my friends decided to wake up early and headed to 7 Mile beach to watch sunrise. It was worth waking up early although we were a little bit tired after a long day with 2 lessons! The beach was calm and peaceful with a few local people enjoying surfing and sunrise looked awesome with the calm ocean. As for the lesson, we learned how to change the direction of the board. Every lesson was worth attending as we learned something new. The tides were pretty high on the day and I found it was more difficult for me to control the board but still I really enjoyed my last lesson as much as other lessons! Saying goodbye to other campers and staff were pretty sad. Although it was only 3 days, spending all day and night with them is now an unforgettable part of my journey in Australia. I made new friends, shared good time together, learned basics on how to surf and most importantly how fun it is to surf! Some of my friends even decided to return on the following week and I would love to come and join the camp again too!